The Mammoth Book of Cover-Ups: The 100 Most Disturbing Conspiracies of All Time, Jon E. Lewis (London: Constable & Robinson 2007). 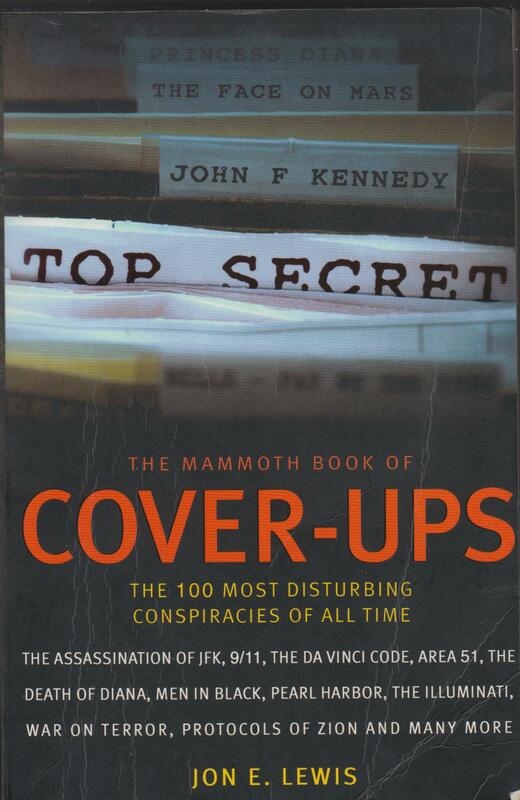 As the book’s cover tells you, this is a popular treatment of 100 assorted conspiracies, ranging from the assassination of JFK, 9/11, the Da Vinci Code, the death of Princess Diana, the Men In Black of UFO lore, the belief that Roosevelt knew about the coming Japanese attack on Pearl Harbour?, the Illuminati, the Protocols of the Elders of Zion and so on. It’s a selection of conspiracies and conspiracy theories that were current at the end of the 1990s and early part of the 21st centuries. As you might expect of a popular work of this size, the individual chapters tend to be brief. Many are only about two or three pages long, and so this isn’t an in depth examination of them by any means. Most of these theories are absolutely spurious, and so get properly debunked. Most, but not all. Some conspiracies, like the Iran-Contral scandal and the Masonic lodge P2, which was deeply involved in Italian Fascism, the Mafia and had connections to the CIA. Lewis writes in his introduction that his aim has been to understand and treat the conspiracy theories objectively, to find which are true, and which aren’t. Hostility to conspiracy theory is as useless in understanding the world as an indiscriminate acceptance of it. The task, surely, is to disentangle the mad and bad conspiracies from those that illuminate the darkened, secret corners of power. To this end The Mammoth Book of Cover-Ups takes a considered, objective scalpel to one hundred of the most compelling conspiracy theories of modern times. The theories are arranged alphabetically, assessed and interrogated. Where appropriate, the relevant documents are reproduced, and details of where to look to find out more are listed. Each conspiracy theory is assigned an “Alert Level” rating indicating its likely veracity. (p. 3). One conspiracy theory that the book thoroughly debunks is Holocaust denial, discussed on pages 180-2. The first two paragraphs briefly state what it was, and how its existence is supported by a mountain of very trustworthy evidence. The Holocaust is the name given to the extermination of some six million Jews and other “undesirables” by the Third Reich of Germany between 1933 and 1945. To industrialise the genocide process, the Nazis purpose-built a number of death camps such as Auschwitz, which gassed the Jews in batches; most victims, however, simply died of malnourishment in concentration camps. In occupied Eastern Europe, from where more than five million Jews were taken, special SS killing squads, Einsatzgruppen, sometimes shot Jews in situ. A wide spread of sources confirms the nature and extent of the Holocaust: the thousandfold testimonies of camp survivors; film and photographs taken by Allied reporters as the camps were liberated in 1945; the confession by Auschwitz SS camp commandant Rudolf Hoss; the prosecution of Adolf Eichmann in 1960-2 and his sentencing to death for “crimes against humanity”. But all of this is dispute by a number of historians and politicians, who speculate that the Holocaust, if it happened at all, was on at most a minor scale. (p. 180). It then goes on to discuss David Hoggan and his The Myth of the Six Million, one of the earliest and most influential books pushing the lie that the Holocaust never happened. Hoggan claimed in it that the Jews had falsely accused the Germans of genocide in order to gain reparations. This set the pattern for later works, claiming that the Jews had made it up either to gain money or international sympathy. It was the latter which led the United Nations to look kindly on the creation of Israel as a Jewish homeland. The book notes that from 1970s, the most prominent mouthpiece for Holocaust denial in the US has been the Institute for Holocaust Review, led by the neo-Nazi Willis Carto. Publications from the Institute and similar organisations in the US speculate that the gas chambers at Auschwitz weren’t there to kill Jews, but to kill the lice they carried. There are many versions of Holocaust denial. One of these is that there was indeed an extermination of the Jews during the Nazi occupation, but that this was small and not official Nazi policy. This was the view of the notorious David Irving, who claimed that the Nazis were too busy fighting the war to organize the mass extermination of the Jews, and that Hitler was unaware of it. The chapter goes on to describe how Irving’s version of the Holocaust and Hitler’s involvement was challenged by Deborah Lipstadt in her 1993, Denying the Holocaust. This accused Irving of anti-Semitism and distorting evidence. Irving sued her and her British publisher, Penguin, for libel. Lipstadt and Penguin defended themselves by hiring the Cambridge historian Richard J. Evans, who then went through Irving’s works. He found that Irving had deliberately used unreliable documentation. One such was the report made by Fred Leuchter, who designed gas chambers for the American prison service. Leuchter stated that he found no significant deposits of cynanide at Auschwitz. However, this was in 1988, nearly 40 years after the camp was used and Leuchter himself was not trained in forensics. Evans also found that Irving also expressed very anti-Semitic sentiments in his books, such as calling Jews ‘the scum of humanity’. The court found in Lipstadt’s favour, with the judge declaring Irving to be ‘an active Holocaust denier; that he is anti-Semite and racist, and that he associates with right-wing extremists who promote neo-Nazism’. Fifteen other leading Nazis attended the Wannsee conference in 1942, which was held outside Berlin on how the extermination of the Jews could best be arranged. The meeting was minuted, and its protocols used to incriminate those present. The Holocaust happened. Most reputable historians put the lower limit of Jews, gypsies, Romanies, homosexuals, Jehovah’s Witnesses, the disabled and the mentally ill exterminated by the Nazis at five million. The upper limit is as high as 11 million. In 1979 the Institute for Historical Review offered a $50,000 reward to anybody who “could prove that the Nazis operated gas chambers to terminate Jews”. Mel Marmelstein, an Auschwitz survivor, forwarded to the IHR affidavits concerning the fate of his family in Auschwitz plus other documentation, and duly claimed his money. When the IHR failed to give him the $50,000 he sued. The court awarded him the $50,000 plus an extra $40,000 for distress. In other words, the leading outfit for Holocaust denial, giving it its best shot, could not convince a neutral jury of its case. (p. 182). The book properly gives Holocaust denial an alert level of zero, as it is a completely false conspiracy theory. Michael Shermer, Alex Grobman and Arthur Hertzberg, Denying History: Who Says the Holocaust Never Happened and Why Do They Say It?, 2002.